When a tooth is threatened by severe decay, periodontal disease, or damage from an injury, a skilled dentist or endodontist must make a judgment call concerning the course of treatment. If the pulp of the tooth is infected or inflamed, a root canal is commonly the only way to save the tooth. During a root canal procedure (or endodontic treatment), the soft tissue in the root of the tooth is removed. This tissue contains veins, arteries and lymph vessels. Once the roots are cleaned out and widened, they are filled with a special rubber material. 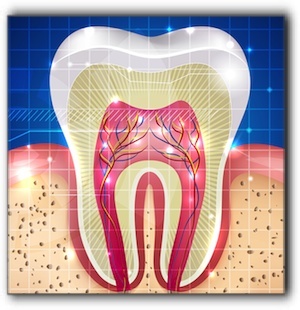 The root canal is only the first step in the complete tooth restoration. After the root canal, without a crown, the tooth will become dry and brittle. The final steps are the core build-up and crown. At Brookside Dental, we fabricate strong, natural-looking crowns that blend perfectly with the surrounding teeth. With proper oral hygiene and regular visits to your dentist, a tooth with a filled root can often function problem-free for the rest of a patient’s life. I am Dr. Brian Westover DMD and Robert Kowal DDS, DMD, DDS, of Brookside Dental. I have been practicing dentistry since 2011. During that time I have seen hundreds of teeth saved by this effective dental procedure. Root canal therapy at Brookside Dental in Clackamas has a very high success rate. Because teeth with infected pulp tissue often cause no symptoms, it is critical to have regular dental examinations. I can determine which (if any) teeth have infected roots. If the infection in the soft pulp tissue is left untreated, it can proceed to a point where the tooth cannot be saved. Is it time for an intensive dental exam? Call our office at 503-905-3380.